Homemade birthday gifts are one of a kind. 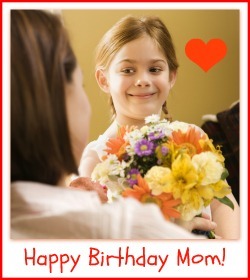 The most popular and cherished birthday gifts for mom are definitely homemade! Do you remember giving your mom something silly as a child - maybe a mud pie or a pretty rock. I bet she loved it because you gave it to her. Here are some good ideas to start you off with. Make her breakfast in bed with delicious blueberry pancakes, melon in season, fresh squeezed orange juice. Add cup of delicious coffee or tea in a pretty new cup. If you don't have a cup already - consider one with a lid like the ones below. The lid keeps the tea or coffee warm longer and it keeps it from spilling too! These are great homemade birthday gifts for mom that she'll love. Add a single rose and a copy of her favorite magazine. Make a beautiful hand written card with the plans for the day. For example ~ After breakfast in bed, the family will proceed to the park for a refreshing walk. Followed by a chick-flick movie at our local theater. Dad is taking you out for a romantic dinner while I watch the kids. Refrigerator magnets make unique homemade gifts. Plus, they cost so much less when you make them! Most craft stores will have everything you need. ~ Fabric - get colors your mom likes. Tiny scraps of fabric used for quilting usually have cute small prints or flowers. You may already have some at home. ~ Cute pictures on card stock - either print them yourself or find some postcards at the stationary store. You can also draw little flowers, hearts, her initials etc. ~ Family photos and pets photos look really cute! Glue the image to the marble with clear drying glue. Glue the magnet to the back with strong glue. Any framed photo is a perfect homemade gift for mom. You can pick up some really great frames at super low prices. Check out discount stores, garage sales, or thrift stores. Gather the family together and start snapping. Pet photos top the homemade birthday gifts for mom list. Put their picture in a frame with a special doggie or kitty message. You can also put a twist on this idea and take several funny pictures. Decorate the frames with silly quotes. Did you know you can make a personalized book with your pets . . . this is the perfect homemade birthday gift for mom! She'll love it. Mom certificates make unique homemade birthday gifts for mom. In essence, these are "gifts of time" for your mom to relax. If you have a younger sister or brother, give a gift certificate for a night of baby-sitting. Here are other ideas: good for one homemade meal (whatever is your specialty), good for 1 hour of errands (if you're driving already), good for 2 hours of house cleaning, good for 1 car wash and vacuum. 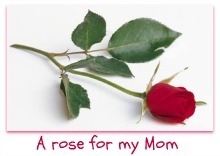 List the things your mom loves for you to do for her . . . then give her certificates for them! Don't forget to put them all in a homemade gift box that's decorated really cute!